As South Florida’s largest independently owned truck rental company, we offer the widest selection of late model, clean, and reliable trucks. We have cargo vans, from 14′ to 26′ straight trucks, refrigerated trucks, flatbed trucks, refrigerated trailers, and single and tandem axle tractors. TLC’s safety and risk management program, an exclusive in our market. Our team of trained professionals helps you make the best decision in your transportation needs. Insulation from residual risk at time of sale. Insulation from operating risk such as premature mechanical failure, which can result in unexpected costs, customer service failure, and driver dissatisfaction. We help you manage and mitigate safety risks and handle regulatory compliance, such as DOT, EPA, OSHA, etc. 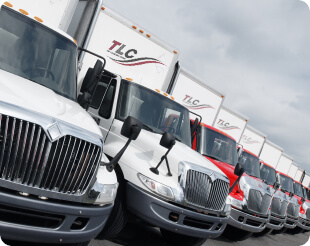 You can outsource your transportation requirements to TLC’s professionals, which allows you to concentrate on your core business. Frees up capital, providing your company to redeploy your financial resources that more directly impact your business. Improves cost predictability, and smoothes cash flow. A financing alternative that allows you to minimize tax exposure and improve your return on assets. Capturing opportunities for increased business, and seasonal business upturns. Leverages TLC’s significant buying power for the purchase of vehicles, while saving you the time, and effort to spec and buy the right vehicle. Improved professional driver recruiting, morale, and retention, resulting from properly spec’d vehicles and well maintained vehicles. Safety training for personnel can reduce your liability exposure, accident frequency and severity, insurance and claims costs, as well as limit lost time and improve productivity. Relieves you from administrative and management time spent on fleet management hassles. Proper fleet management services improve operational efficiency and productivity. Management reports help monitor vehicle performance for continuous improvement. A reliable system with back-up support ensures on-time delivery and allows you to respond quickly and efficiently to customer needs. Vehicles in good condition improve the image of your company. TLC’s services can provide you with a transportation infrastructure to venture into new markets. Allows you to preserve capital and divert it to core business opportunities. One contact for all your fleet needs.